Now that the Cinco de Mayo celebrations are over, you’re probably wondering what to do with all those empty Patron bottles. Well I have an idea for you. Have you heard about The Art of Patrón contest? It’s a contest that Patrón is holding in which they’re asking you to repurpose their bottles into works of art. Repurposing and upcycling is a major part of my DIY point of view, so I was really excited when Patrón approached me with the opportunity to create my own projects using their bottles. Think about all of the cool things you can do with these things! I mean just take a look at some of the last year’s finalists. Incredible right? The grand prize winner gets $10,000 and nine finalists get $1,000 each. So that’s a pretty good incentive to get to work on your own bottles. Plus you get to show off your DIY skills and end up with your very own piece of upcycled art. You guys are pretty creative. I’m sure you can come up with something. Be sure to check out the official Art of Patrón site for details on how to enter the contest. One of my first thoughts when I saw the bottles was “Score! 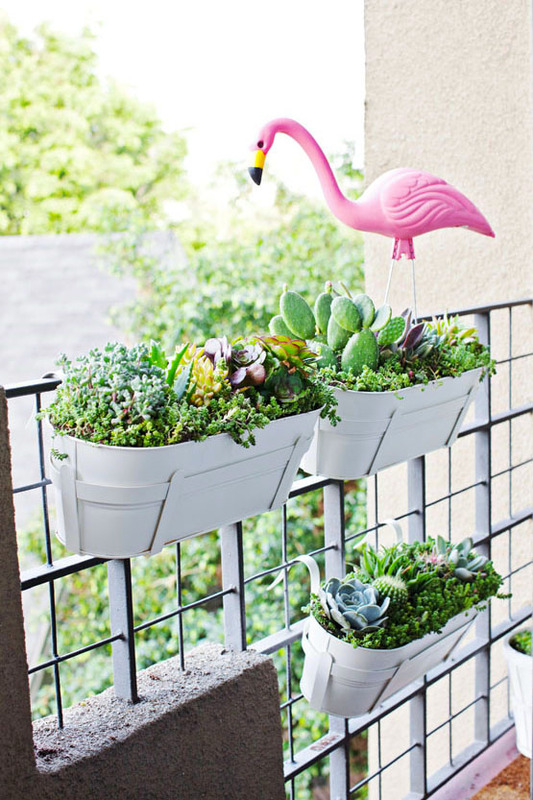 New succulent planters!”. 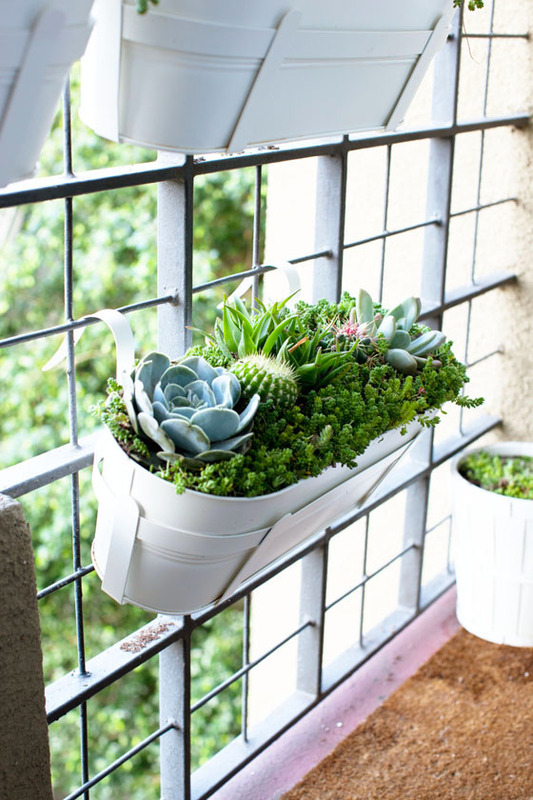 I’m not a natural green thumb, but I’ve had a lot of success with outside succulents. I wanted to bring some inside and over to my bar, so I thought what better planter for a bar setup than a planter made out of a tequila bottle? Really, all you have to do is cut the top off of the bottle. There are plenty of ways to cut glass bottles, and if you’ve done it before you can use your method of choice. For this project I used a diamond wheel on my rotary tool. If you’ve never used a rotary tool to cut glass, it’s pretty easy. Just take your time and go slowly and you should be fine. These bottles are thick and have square edges, so it was a little more challenging than a standard round bottle would be, but the results are worth it. Make sure you cut your bottle to the appropriate height needed for your plant. You can use the pots they come in as a guideline. All I did was mark a line where I wanted to cut and went at it with my diamond cutting wheel. I did a rough line because I wanted an imperfect, hand-crafted looking edge. Safety first! If you’re going to work with glass, for the love of God please wear safety glasses and gloves. I repeat, wear safety glasses and gloves. Oh speaking of safety, after you cut the bottle, make sure to sand down all of the sharp edges. 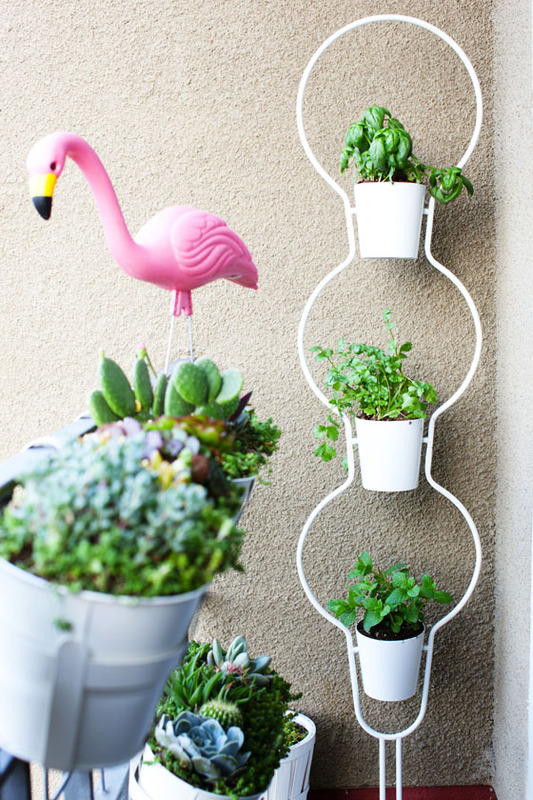 They can get pretty sharp and you don’t want to ruin your impressive new Patrón planters by bleeding all over them. 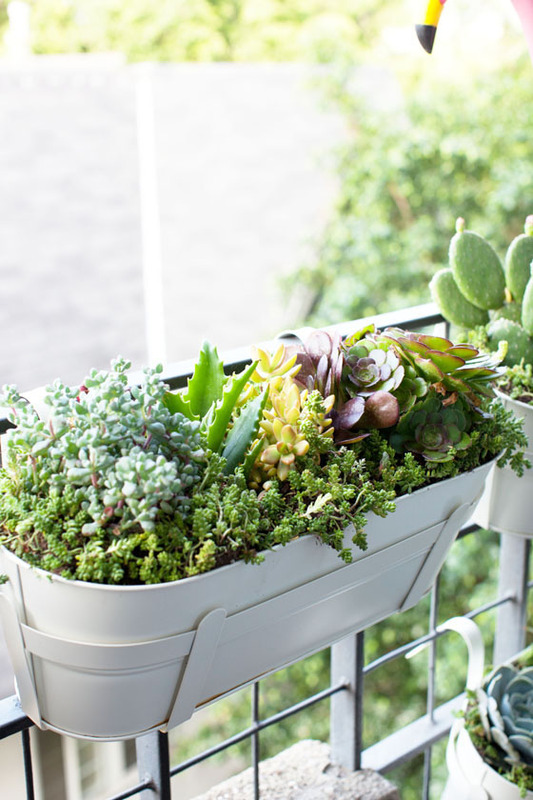 Once you’re done cutting and sanding, just fill up the planter with your greenery and pat yourself on the back for being amazing. Are you inspired yet?! If you want to enter the Art of Patron contest, make sure you submit your entry before July 17, 2015. Who knows, maybe you’ll win those $10,000! This project was sponsored and made possible by Patrón. I have a confession to make. I am a plant killer. Yes, it’s true, I have murdered many of plants. I wasn’t always a killer though. In fact when I was younger I fancied myself a green thumb, but somehow along the way I became the black widow of gardening. My latest killing spree happened when I attempted to plant herbs and lavender on my balcony. It was pretty for like, a day, and then it all went to hell. I won’t even show you pictures of the crime scene. I’m too embarrassed. Now that I’ve come to terms with my inability to maintain flowers, and apparently herbs, I’ve decided to attempt and embrace succulents and cacti. I’m no stranger to native succulents and cacti. I grew up throughout Southern California and in the desert where our lawns consisted of mostly rocks, palms, and some variation of cacti. I don’t want to speak too soon, but I think low-maintenance plants will be the key to my success. As you can see we used window box style planters from IKEA. We have a tiny balcony and we wanted to see the plants through the window, so these were our best bet. (I’ve had these for over a year, so I can’t find them on IKEA’s website to be able to link you.) 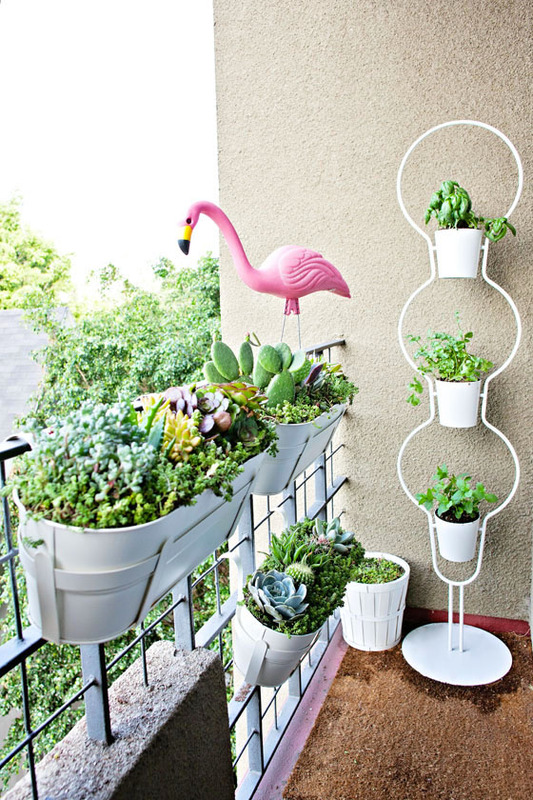 The only problem was there were no drain holes, and well draining pots are necessary with succulents and cacti. We ended up drilling holes into the bottom to ensure drainage. We took a trip to the nursery and came home with a variety of plants and a couple of cacti. We also picked up specific “well draining cacti, palm, succulent” soil, because I am not taking any chances this time. Don’t ask me the names of any of these because I have no idea. We’ve just been calling them “the yellow-ish one” and “the one that looks like jellybeans”. So scientific. 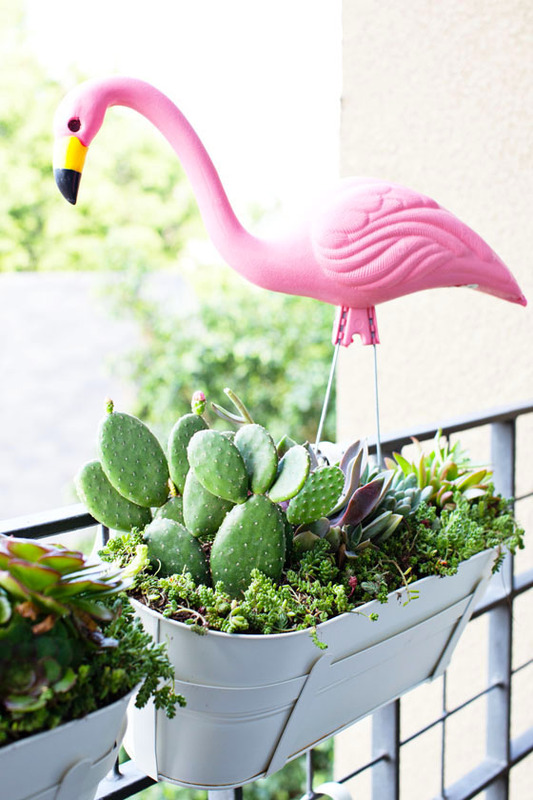 Anyway, we just plopped them in and filled any empty spaces with succulent-ish ground cover and prayed to Frank the Flamingo to watch over them all. One thing I did learn the hard way is if you’re going to handle any kind of cacti, WEAR GLOVES. These little jerks sneak up on you with their prickly thorns. We’re also attempting “weed like” herbs with hopes that they’ll grow like weeds and not die a horrible, temperamental, death like my lavender and rosemary of gardens past. I’m actually leaving those up to my husband. I can’t be trusted.